PLASTER-CASTED and battle-scarred, Britain's pursuiters took silver behind the Ukraine in the team pursuit, refusing to let recent injuries stop them from claiming their medals. But there was a tinge of disappointment that the world title had eluded them for a second consecutive year. "Four months ago we were definitely on for a gold, it was merely a formality to get through to the final," said Newton, one of the few riders to escape serious injury in the weeks leading up to the championship. "It's pointless to say it's because of the crashes. We were closer to the gold than last year." 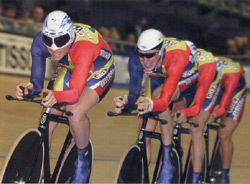 In the qualifying ride, Steve Cummings took Bradley Wiggins' place so that Wiggins would be able to rest after the individual event the previous day. It was Cummings' first senior World's, and both his teammates and the management were impressed with his performance. "You can be never be sure about someone's first race, but Steve was fantastic," said endurance coach Simon Jones. Knowing it would probably be his only ride of the championships, Cummings rode as if it was the final, helping the squad to the third fastest qualifying time. "I tried to stay relaxed, but it just doesn't compare to under23 competitions," Cummings said. "The WCPP [World Class Performance Plan] have helped me all year, so it's good to be able to give something back." With the Ukraine, Germany and Great Britain posting clearly superior times in the qualifying round of the competition, Simon Jones' pre-event prediction of "a medal, but I don't know what colour" was an accurate assessment of the squad's chances. Jones and the WCPP staff have taught the riders to concentrate on the process of riding - in the belief that the results will follow - rather than the final outcome of each ride. This approach showed its worth as Britain's technically perfect ride contrasted with Germany's slipshod semi-final effort. The defending team found themselves left to fight for a bronze medal after losing Stefan Siedler three kilometers into the ride, and leaving Jens Lehmann hanging perilously far behind for the last few laps. Complicating things even further, the timekeeper fired the finish gun before the team had come down off the final banking - several seconds before they crossed the line - giving them 4-04, the fastest time of the competition. Everybody, including the German coach, looked confused as the commissaires hurriedly rewound the tapes and corrected the time to 4-08, one second slower than the British squad. With the new world individual pursuit champion Alexandre Symonenko joining the Ukrainian team for the latter stages of the team competition, Britain faced a formidable opposition in the gold medal final. For the first kilometre the Britons held the Ukrainians within a quarter of a second, but the gap steadily crept up as they passed the two- and threekilometre time checks. Both teams were reduced to three men in the final 1,000 metres, and although Manning, Steel and Wiggins dug deep to claw back half a second in the final laps, it was not enough. Wiggins had to sit on the stairs down from the track edge after dismounting. "We pushed them closer than ever before, a World's silver is still amazing," he said once he had got his breath back. "It was 100 per cent maximum effort all the way, I didn't see where they were. It's a great way to end my amateur career," he added. For Newton, it was proof that misfortune is no obstacle for a harmonious team. "I'm pleased that we've bounced back," he said, "and that we've found that Steve has such talent."